Whitening | Eastern Long Island, NY | Joseph F. Sciotto D.M.D. Seems as though just about everyone is doing it these days! Getting that “Hollywood Smile” is a regular pastime and the number one requested cosmetic dentistry procedure. While many people buy the “drugstore brand” of whitener, our office whitening procedure produces better results, and in only a fraction of the time. Teeth whitening is the most requested cosmetic dentistry procedure! Want to know more? Call Joseph F. Sciotto D.M.D. and we’ll gladly provide you with the pros and cons of the different types of whitening procedures. Are In-Office Procedures Better than At-Home Procedures? The whitening procedure that we do at Joseph F. Sciotto D.M.D. generally takes about an hour and the results are immediate. After ensuring that the gums are protected, a bleaching agent is applied to the teeth and it does all the work! Our office also dispenses take-home kits along with a custom-made mouthpiece. These 10% carbamide peroxide (the bleaching agent) gels are generally used for two weeks in order to obtain the desired results. Over-the-counter bleaching kits also contain carbamide peroxide, but you won’t get the custom-fitted mouthpiece, and your saliva tends to weaken the effectiveness of the gel. 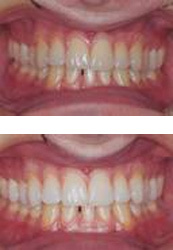 Notice the difference in the upper teeth in these two photos! Some people experience tooth sensitivity after using bleaching agents. This is usually temporary and goes away after completion of the whitening process. Others notice irritation of their gums – especially when the bleaching tray is not custom made and the gums come in contact with the bleaching agent. Side effects should always be brought to our attention so we can advise you on whether they are typical or not. And… you certainly don’t want your teeth to glow in the dark, do you? So be safe and know when to say when and that’s usually when the color of your teeth match the whites of your eyes! Want to be really safe? Schedule an appointment with Joseph F. Sciotto D.M.D. and let us make your smile shine! Give us a call to set up a convenient time to meet. You’ll be happy you did!